Echo have an excellent, and well deserved, reputation when it comes to audio and MIDI interfaces, a number of which (such as the Mia) have sold by the bucket-load and become instant classics. Martin Walker gave the Audiofire 12, Echo's first Firewire-based interface, a very positive review back in the October 2005 issue of SOS. Of course, not everyone needs masses of analogue I/O and Echo have now added the Audiofire 4 (reviewed here) and Audiofire 2 to the range. So, if you are in the market for a compact audio and MIDI interface from a reputable brand, what does the Audiofire 4 have to offer? The Audiofire 4 features four-in/four-out, 24-bit/96kHz analogue connectivity (hence the '4' in the model name), with an additional two-in/two-out digital channels via S/PDIF. Two of the analogue inputs offer 48V phantom power. The analogue and digital channels can be used together for simultaneous six-in/six-out operation, all via Firewire to your host computer. MIDI I/O is included, as is a headphone output. The Audiofire 4 is certainly compact, measuring only 150 x 150 x 35 millimetres. The construction is sturdy, with only the three trim controls on the front panel likely to suffer in the event of careless handling in transit. The front panel features two universal inputs suitable for mic, guitar or keyboard sources. These include the aforementioned trim controls, three-stage LED metering and phantom power. Also present here is a power switch. While an external power supply is included, the unit is entirely bus powered if using a six-pin Firewire interface. A mini-jack headphone output with associated volume control completes the front-panel line-up. The rear panel is equally busy, with power, S/PDIF, twin Firewire and MIDI I/O sockets sitting alongside the four analogue outputs and analogue inputs three and four, all of which are balanced. The compact format obviously necessitates some compromises in terms of physical controls. The limited metering is understandable and there are no physical switches for engaging the phantom power: this is done via the Audiofire 4 Console software. There is also no master volume control for the main audio outputs, so if you need to adjust overall playback levels it has to be done via the software. While the Audiofire 4 is not the only compact audio interface to adopt this approach, users with no other way of easily taming their playback system might find that the software-only volume control becomes a little irritating with time. If you can manage without the mic preamps and with a two-in/two-out analogue format, Echo's Audiofire 2 provides an even more compact solution. This unit is not dissimilar in general features to the classic PCI-based Mia MIDI and, at £169, provides a very cost-effective solution in a box with a footprint about the same size as a CD case. MIDI and S/PDIF connectivity are also included. In addition to the Audiofire 4 itself, the box includes the external power supply, an eight-foot Firewire cable and a software CD-ROM. A copy of the Tracktion MIDI + Audio sequencer is also included in the bundle. This is v1, rather than the most recent release (so see the review from the April 2003 issue of SOS for details), but it provides a functional DAW environment for those without one of the more mainstream alternatives. Installation of the drivers and Console software proved painless on my test systems and I had the Audiofire 4 up and running within a few minutes of opening the box. The installation process included a quick check on the Echo web site to make sure both software and firmware were up to date. Also on the CD is a useful PDF manual (no printed documentation is included). 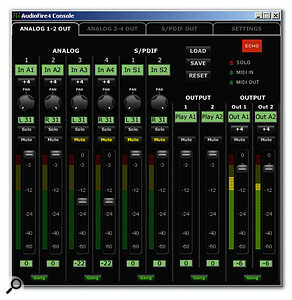 This covers the entire Audiofire range, but it does provide a helpful guide to the Console software. As many of the unit's features can only be accessed via software control, the manual is well worth a read-through before you do any serious work. The Audiofire 4 Console software is similar in operation to that of the Audiofire 12 described by Martin in his October 2005 review, with the obvious difference that there are fewer channels to worry about here. A separate software mixer is provided for each pair of outputs, allowing different mixes of the various input signals to be sent to each of the output pairs. Even with the smaller number of I/O channels offered here, there is plenty that can be done — once the manual has been read thoroughly! The faders for mixing the analogue inputs are straightforward enough, while the output faders on the far right control the overall output for the particular output pair (that is, the mixed signal from the host application and any signals arriving via the hardware inputs). The faders to the left of these (labelled Play A1 and Play A2 in the screenshot overleaf) control the playback level of the output from the host software, and it is therefore easy to create a suitable monitor mix balance inside the Console between tracks already recorded and new material arriving at the inputs. Aside from useful information about the currently selected sample rate, clock source and driver versions, the Settings page includes switches for phantom power, S/PDIF format and buffer size — all very straightforward in operation. The sound quality of the Audiofire 4 certainly seems up to the task. Playback of a selection of commercial recordings in a range of styles, from rock through to orchestral music, demonstrated that the analogue outputs produce solid bottom end and clear mid- and high-frequency response. The stereo imaging also seems to be good, and a direct comparison with the ageing but well respected Echo Mia 24, also installed on my desktop test system, suggested that it's in this area that the most notable difference between the two units is found: playback through the Audiofire gave me a greater impression of being able to hear into the details of a mix. It also seemed slightly crisper at the top end. The Audiofire 4 Console provides plenty of flexibility for mixing input and DAW output levels.While the mic preamps are probably not going to challenge those in a high-end interface in terms of quality, recording both acoustic guitar and vocals produced very good results. Providing the usual care and attention is paid to the rest of the signal chain, I'd have no qualms about using these preamps for everyday recording projects. The lack of a front-panel master volume control aside, the only other criticism I'd make is that I wouldn't have minded just a touch more gain on the headphone output; otherwise the sonic performance of the Audiofire 4 is very good indeed. Echo have always had a good reputation for their drivers. The same driver set supports the entire Audiofire range and, as Martin Walker found with the Audiofire 12, ASIO performance proved to be rock solid in Cubase 4, on both desktop and laptop systems. I was able to get down to a perfectly comfortable 256-sample buffer size on both systems, while playing back a complex mix involving some 20 audio tracks and various VST instruments and effects, and simultaneously recording a stereo track. Both audio and MIDI functioned as advertised and with a minimum of fuss. Performance with other applications, such as Sound Forge and Acid Pro, was equally solid. A wide range of portable audio and MIDI interfaces is currently available, and at this price point the Audiofire 4 has plenty of competition from the likes of Focusrite, M-Audio, Emu and Presonus, to name just four. While the degree of choice might make it difficult to decide which to buy, devices from all these manufactures can produce very good results. Of course, the detailed specifications of all the available units are different and that, plus the range of price points, means there ought to be something in this format to suit almost everyone's needs and budget. That said, potential purchasers are unlikely to be disappointed with this new Echo interface; it is solidly built, compact and delivers good audio results. While the Audiofire 4 doesn't offer enough I/O for me personally to choose it as the main interface in my own project studio, I'd happily slip one of these units in my laptop bag and be fully confident that I could get some high-quality recording done while I was on the move. No front-panel master volume control. 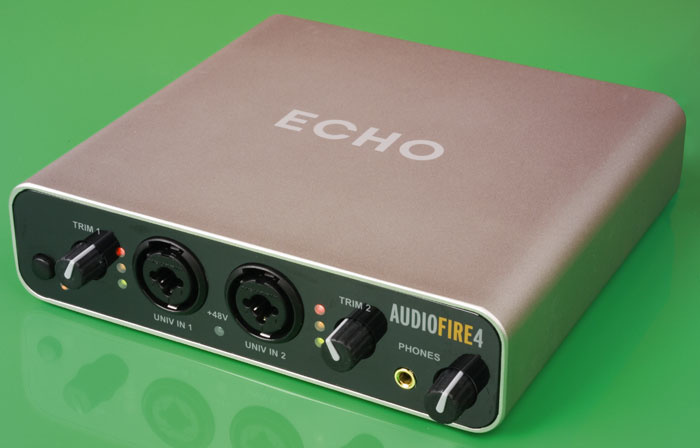 Echo's Audiofire 4 provides compact and very capable audio and MIDI interfacing. If the I/O configuration suits your needs, this device would make an excellent companion to a laptop studio for recording on the move.